In tandem with harvest, the summer months of January and February also see the distillery at Snowy River Lavender in full swing. All processes in our current system of distillation are done manually and require a great deal of dedication and skill by those working distillation processes to ensure everything proceeds smoothly to produce essential oils and hydrosols of the highest standard. Our focus is on producing boutique essential oils, which means respecting the integrity of the specific plant matter being distilled, with each distillation performed as a discrete and complete process. 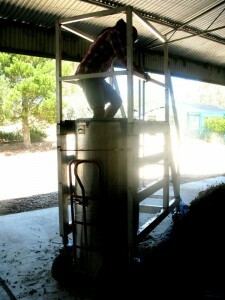 It is important for us to record each still charge and to be able to trace that charge back to a bottle in the cellar. 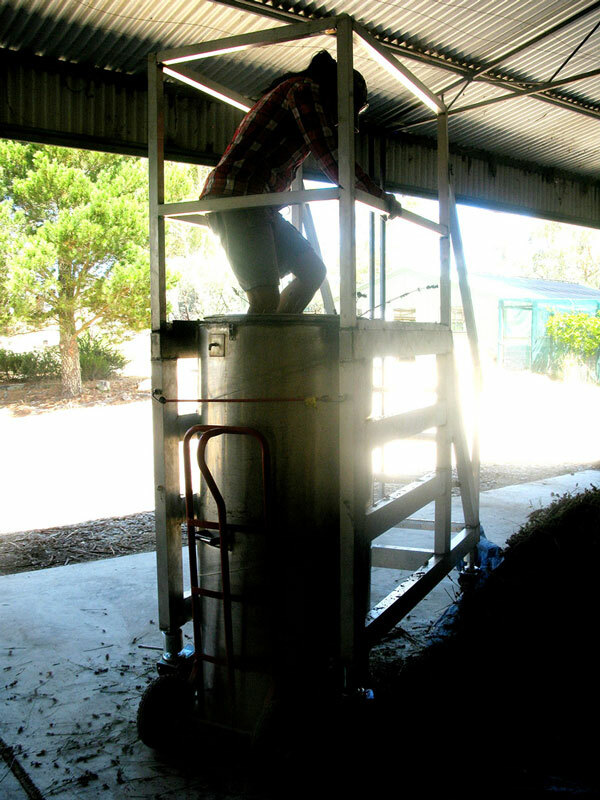 All essential oils and hydrosols at Snowy River Lavender are produced through steam distillation. This is the process where low-pressure steam is passed through a vessel of compacted plant matter. As the steam moves through the vessel volatile compounds held within the plant matter are released into the vapour. This steam vapour laden with plant chemistry rises naturally to the top of the distillation chamber and moves into a water cooled condenser where the vapour is returned to liquid form and passed out of the condenser into a collection vessel called a separation flask. This liquid, known as distillate, settles in the collection vessel separating into essential oil and hydrosol. Most essential oils are lighter than water and will rise to the top of the flask. 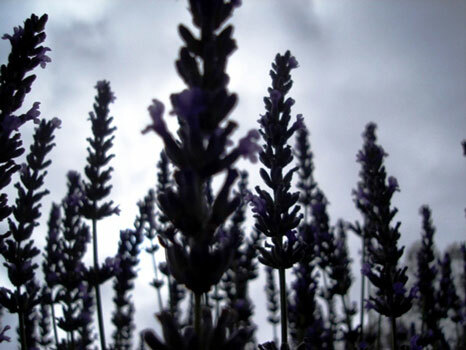 Lavender’s specific gravity, or relative density, is usually around 0.880-0.890 with lavandin higher at 0.887 -0.899. This physical characteristic of essential oil allows the hydrosol to be tapped off from the lower part of the collection vessel into a storage container, in which it is later stored in a cool cellar until packaged for sale. It takes longer for the essential oil to build up in the collection flask and the hydrosol will be tapped off many times before the oil has built to a level, usually 1 litre, where it will be decanted into an amber glass bottle for storage and sealed from the air immediately. Snowy River Lavender’s stainless steel distillation unit is a customized version of the principles and designs set out by the late Tim Denny, of Bridestowe Lavender Farm, in his publication, ‘Field Distillation of Herbaceous Oils’. This distillery has one still with tandem distillation chambers. One chamber is distilled while the other is packed with the next charge of flower and in this way we can process 3 or 4 charges per day, each running between 2 and 2 ½ hours. Each distillation chamber has a 440-litre capacity, taking between 100 to 125 kilograms of field harvested lavender or lavandin flower. Typically, each charge produces, depending on the plant being distilled, between 1 and 3 litres of essential oil and between 10 and 20 litres of hydrosol. Significant pre-distillation processes are caring for cut flower; packing & setting the still: Distilling demands care, knowledge, vigilance and recording: Post- distillation demands cool, dark, airtight conditions and patience. Both commercial and therapeutic standards are predicated on phyto-chemical information derived from gas chromatography and mass spectrometry (GC/MS). These technical processes give a snapshot of an essential oil’s chemistry. Standards normalize these profiles as species specific balances where, the presence of key compounds, are notated within an acceptable maximum and minimum range. These chemical ranges and balances are generally perceived as universally accessible indexes of essential oil quality. At Snowy River Lavender, aromatic beauty and essential oil chemistry are both key factors in our assessments of quality however we also see quality as integral to the vitality of plants that are well grown, nurtured organically by the life of the soil and the purity of the environment to which they are tuned; Quality is also in the timing of harvest and in the distillation process where the special synergy of each plant’s chemistry is combined with others and completed in each still charge as a discrete and fully developed process. This recognition of quality as integral to the culture of production allows us to view the quality of our essential oils as a holistic journey from soil to the bottle. It can be said that the ‘truth’ of an essential oil resides in the culture of production responsible for its existence and that integrity in these productive processes is as important an aspect of quality as the often more accessible indices of aroma and chemistry. 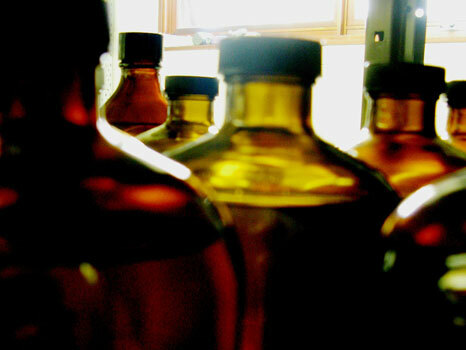 The still, as an artisan’s tool, is central and decisive in each culture productive of essential oils. A bottle of our lavender hydrosol has the appearance of crystal clear water and it is not until you smell its honey rich aroma that you are given a hint of its inherent potency. 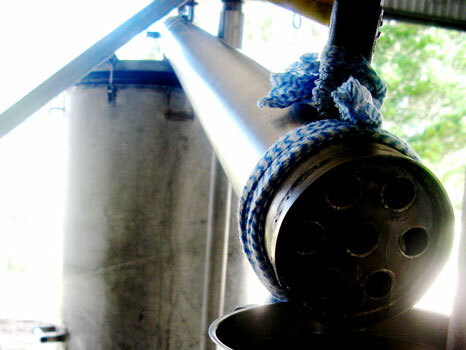 Hydrosol is the pure co-product, with essential oil, of distillation processes. As distillate leaves the still’s condenser and settles in the collection vessel, the essential oil rises to the top and the hydrosol settles on the bottom and the phyto-chemistry which was complete in the plant now becomes two separate products. Hydrosol has both minute residues of essential oil and of itself more of the soluble chemistry of the plant and therefore has its own chemistry with its own unique value of use. At Snowy River Lavender, most lavender cultivars fit easily into the range of compounds allowed in the Standards. However, two of our lavender cultivars, Pacific Blue and Avice Hill, don’t. Given that all our cultivars are grown under similar conditions and distilled at high altitude under the same distillation conditions, the fact we consistently get a different balance in the essential oil for these two cultivars highlights the issue of plant diversity. This in turn raises questions about the uniformity Standards impose on our perception of essential oils which as products, from the natural world, are in actual fact quite diverse.